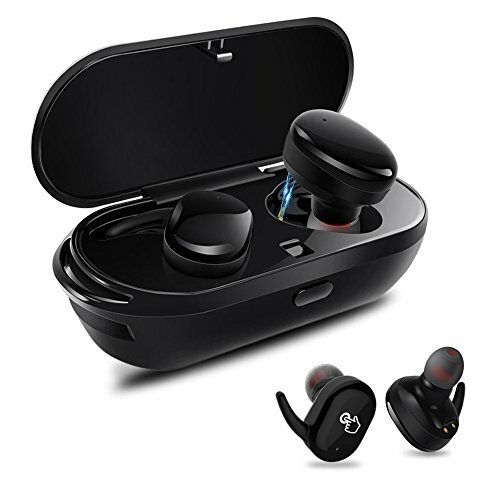 [TRUE WIRELESS,NO MORE WIRE,NO MORE LIMIT] MUSAN Earbuds Adopt TWS technology to make wireless bluetooth 4.1 synchronous connection stereo pairing come true.Without any cord troubles you can enjoy sports and music to the full. It has Pivacy potection Call Design when you have hands-free calls only the main headphone(Left) can transfer voice signal. [ERGONOMIC DESIGN FOR MORE COMFORT] MUSAN Wireless Earbuds is designed base on thousands people's ear data,perfect angle and 3 sizes of ear cap,suit for most people's ear,you may wear it for long without hurting your ears. [PORTABLE CHARGING CASE FOR MORE PLAY TIME] Equipped 450mAh battery in the portable magnetic charging Box,Twins each earphones plug 55mAh,working time/Playtime above 2.5 hours each earbud,the maximum volume of continuous Talk/Music for 2.5 to 3.5 hours and standby time of 120 hours. Don't worry about missing any call or stop music when you are work out . [TWO MODLE: USE ONE OR BOTH] Twins model: Use dual earbuds simultaneously,which means you can share the same music/movies with friends and can enjoy the clear stereo sound by using both headset. Use one: Choose the right/left one,in single earbud mode,each bluetooth earphone can connect with dual Bluetooth devices like your iPhone Android phone iPad tablet laptop and more.